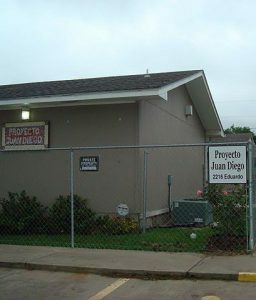 Proyecto Juan Diego, a sponsored ministry of the Province in Brownsville, Texas, began in 2003 with the mission to empower low income families to be healthy and self-sufficient members of their community through educational programs, family activities, and preventative services. Today, Proyecto Juan Diego has over a dozen programs focused on three main areas: Integrated Family Programs, Healthcare for Diabetes & Pre-Diabetes, and Outreach & Civic Engagement. PJD has positively affected the lives of hundreds of families in the Cameron Park community and are continuing to see substantial growth in demand for the services offered, including citizenship classes, Spanish language GED classes, and parenting classes. Due to this large demand, PJD is preparing to build a new community center that will allow them to continue to serve the underserved of the area. The new center will include increased parking for participants, outdoor exercise space, advanced technology, and adjustable program space to meet the needs of both large and small groups. Click here to learn more about the new community building! To empower low income families to be healthy and self-sufficient members of their community.